Stops Some Phone Equipment from Working! If you're getting phone lines from a box of some type it's possible that you're reading this because your phone system isn't working right on that box - even if it worked fine on the old real phone lines or a box from a different provider. You usually can't hear data noise. It's on frequencies above voice frequencies. But the computer(s) inside the phone equipment (all phone equipment is a computer these days), like single line feature phones, modems and KSU-less phones that don't need a central box to work, can sometimes hear the data noise and do strange things. What strange things? It will be different with every piece of phone equipment that's susceptible to the noise. It just causes the computer(s) inside the phone equipment to operate incorrectly. The company who made the phone equipment didn't test to see what their equipment would do if there was garbage above voice frequencies, because there never has been garbage over voice frequencies on real copper phone lines. How do you know data noise is causing the problems? You don't. 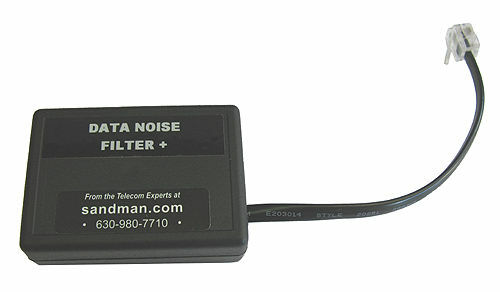 Until you put one of our Data Noise Filters in-front of the phone equipment to see if the problems go-away. You can't hear, taste or smell the data noise. You can see it on an oscilloscope, but that's not easily hooked up in the field. The noise is probably the same on each wire (tip and ring, called common mode), you couldn't hear it. Once you plug the fake phone line into your telephone equipment, that's plugged into the wall, there's now a difference between the noise on the tip and ring because the phone equipment has a reference to ground through the AC power. You still probably can't hear the noise, but the phone equipment may hear it and it may be causing the computer in the phone equipment to do strange things. 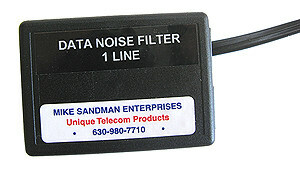 The easiest thing to do is plug a Data Noise Filter in-series with each phone line coming from the fake phone line box. 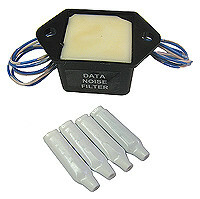 If you're a technician you should definitely carry both the Data Noise Filter and the Data Noise Filer+ with you, so you can diagnosis the problem. We now have two versions of the Data Noise Filter... the Regular and + versions. Which one do you need? I don't know! They use slightly different technology, and the Data Noise Filter+ blocks out lower frequencies of data noise. You need to carry them both! There's no way to know which one will work until you try. of the boxes that provide fake phone lines work differently. If you put a Data Noise Filter on just one line but have the other lines connected without the Data Noise Filter, that may let enough garbage into the system on the other lines (without the Filters) to cause strange stuff. If you disconnect all the other lines and put the Data Noise Filter on the remaining connected line, that would be a valid test to see if the strange stuff stops. You can move the filter to other lines as a test, making sure you disconnect any lines that don't have a Data Noise Filter on them during testing. 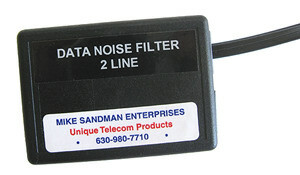 Sometimes the more lines that are connected to the phone equipment from the fake phone line box, the more data noise is sent into the system. You may not have a problem when one or two lines are connected, but you'll have problems when one more line is added because the data noise is over the threshold that causes the computer in the phone equipment to go nuts. Sometimes a particular phone line (like just Line 1) will bring the data noise into the phone equipment, and other lines won't. It depends how close the components or even the traces on a circuit board are to the components or traces going to the CPU. AT&T / Avaya has had problems with their equipment being susceptible to data noise on their stuff for years. In the old days they sold the 90A Attenuator. It was basically the same as our Data Noise Filter, except our Data Noise Filters do a better job attenuating the data noise. The 90A Attenuator came with a goofy cord. We can make you a 90A Attenuator if you want one, but because of the goofy cord it's a little more expensive than the Data Noise Filters. I can't think of any reason for you to buy that instead of one of the two types of Data Noise Filters. Wired KSU-less phones that you'd buy in the Office-Biggie or Biggie-Mart store like Panasonic, AT&T (which is really V-Tech), RCA / GE and other multi-line phones (2 or more lines) that don't need a phone system central box (KSU) to work together really don't like Data Noise on Line 1. The lights or intercom won't work, the phones many not ring, or some other symptom may occur. Cordless phones generally aren't effected because they communicate with each other by radio - not on the wire from the fake phone line. KSU-less phones actually generate and use their own data on Line 1 above voice frequencies, so you can't put a Data Noise Filter right at the phone on Line 1 (the line that's normally used to communicate between phones). If you do the lights, intercom and ringing will no longer work between the phones. BUT, that's the same symptom you'll get from connecting the KSU-less phone's Line 1 to a fake phone line box that puts out Data Noise. The Data Noise from the fake phone line box interferes with the real data being used to communicate between the KSU-less phones. So the features are intermittent or don't work at all. With these types of phones it's critical that you only plug the Data Noise Filter in at the box with the fake phone line, not behind the phone or at the wall jack for the phone. 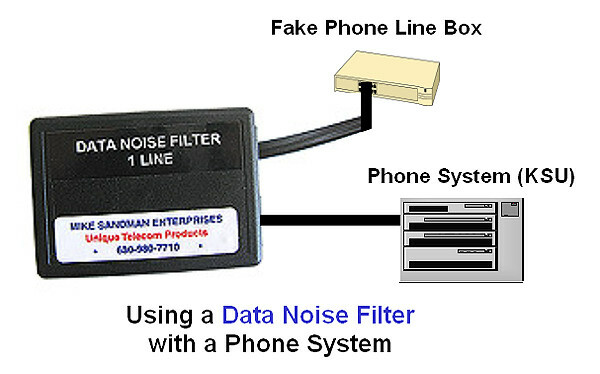 If you put the Data Noise Filter anywhere between any of the phones, particularly on the first line, it will block the communications between the phones. Putting it right at the box will make sure it's not between any of the phones. 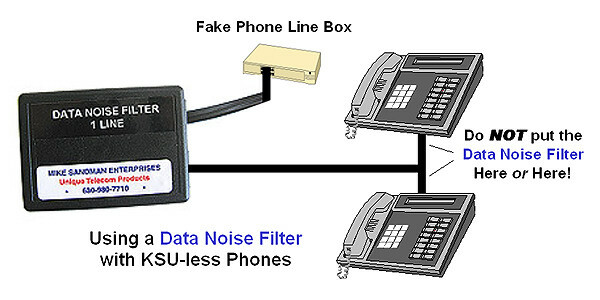 Which of the two versions of Data Noise Filters do you need for KSU-less Phones? There's no way to know until you try one of them to see if it clears your problem. You really need to carry at least one of each in your car or truck! Copyright � 2015 Mike Sandman Enterprises, Inc.